The Korea Kindergarten Association on Friday called off its plan to stage a strike next week. The strike scheduled for Monday was averted as the association representing private kindergartens nationwide agreed to continue talks with the Ministry of Education over its demand for an increase in state subsidy. The decision came after the two sides met for talks at Government Complex Seoul in Gwanghwamun on Friday afternoon. As many as 2,900 private kindergartens, or 58 percent of the 4,245 private kindergartens nationwide, were expected to close temporarily Monday and on Sept. 25-26 as part of the collective action. Their demands include an increase in state subsidy and the withdrawal of the government’s plan to increase the number of state-funded kindergartens across the country. The strike plan, however, sparked fierce criticism from working parents who send their children to those kindergartens as well as the government, which declared their closure as illegal. 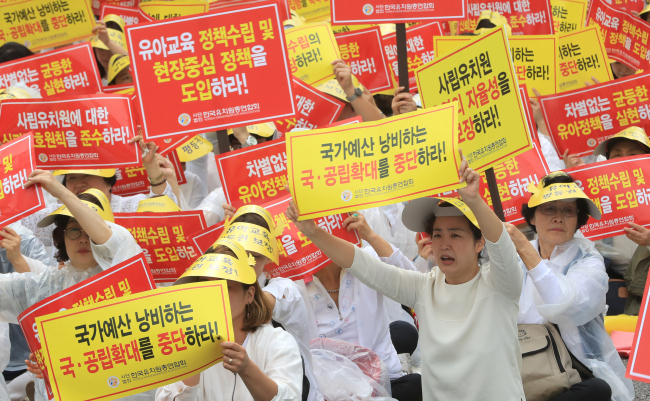 Tens of thousands had signed a petition posted on the Cheong Wa Dae website, calling on the private kindergartens taking part in the upcoming strike to drop the plan.